Dark and natural, the Santa in Furs’ simple color palette embraces a historic tradition. 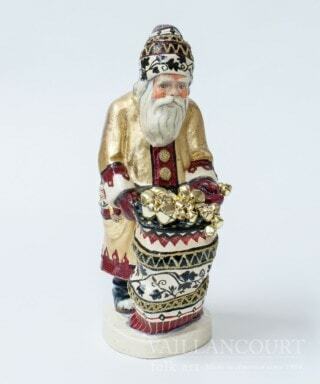 Inspired by dark natural browns, this Santa is painted in a simple palette that is accented by the yellow gloves and belt buckle. Unlike many of the 2018 Chalkware pieces, this piece is void of glitter, beading, or gold leafing. He does, however, have two stark white bottle brush trees and bells adorning the fur around his hat and boots.